17 October 2017 marked the first annual International Sawfish Day, dedicated to increasing knowledge and awareness of sawfish throughout the globe (follow along on social media #IntlSawfishDay). In celebration of this initiative, SOSF has rolled out five informative and educational web articles about one of the ocean’s most critically endangered groups of elasmobranchs. Topics included; Sawfish Biology, Sawfish Habitats, Cultural Significance of Sawfish, Sawfish Threats, and Sawfish Conservation. The ocean, like many of the earth’s environments, is vulnerable to human disturbance and overexploitation. Today, humans continue to overfish natural resources, disrupting the balance of important marine ecosystems. Coastal fisheries threaten the survival of some of the most depleted species, including sawfishes, which have seen population declines of more than 90% around the world and are now extinct in many parts of their former range. 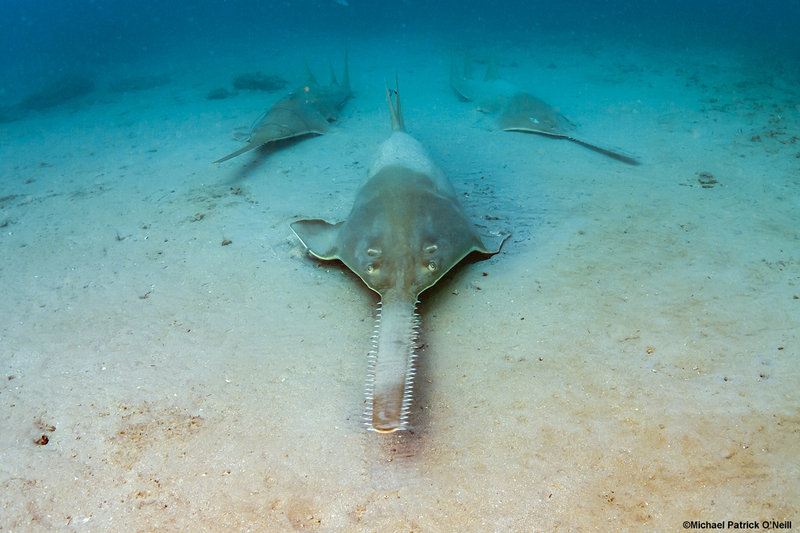 Sawfishes are mysterious, awe-inspiring creatures that captivate ocean lovers. Unfortunately, the threat of extinction is a major concern for this unique family of fish. Currently, three of the five species of sawfish are listed as ‘Critically Endangered’, and two as ‘Endangered’ on the International Union for Conservation of Nature’s (IUCN) Red List. However, all hope is not lost for these animals. Today, advancements in science combined with innovative new technologies and groundbreaking conservation strategies have provided researchers and conservationists with more knowledge, and more resources than ever before. Sarah has a degree in zoology and marine zoology from the University College of North Wales, a MSc in conservation from University College London and more than 30 years of professional experience as a marine biodiversity conservation expert. Her knowledge in marine conservation and policy has been an invaluable asset to SOSF since becoming principal scientist in 2011. In 2011, SOSF funded and launched a sawfish conservation project in collaboration with IUCN’s Shark Specialist Group (SSG). Led by Dr. Nicholas Dulvy, the key objective of this project was to develop a global conservation strategy for sawfishes that included a summary of all available information around the world, as well as recommendations for important research, education and conservation activities. 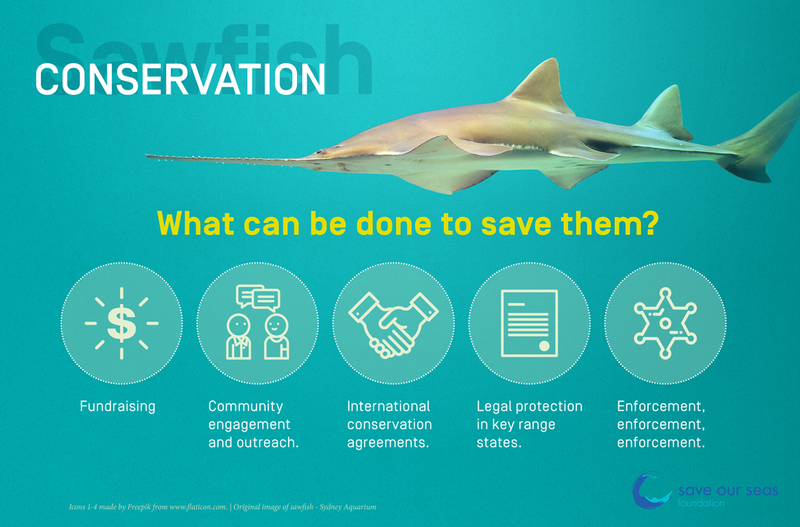 The project began by establishing a global sawfish network (still active), followed by a 2012 SOSF funded workshop, where the world’s foremost experts developed a global sawfish conservation vision and goals, and began the process of prioritizing recommended actions to deliver these. The completed Sawfish: A Global Strategy For Conservation was unveiled by SSG at the 2014 Sharks International Conference in Durban, South Africa. Key objectives of this strategy sought to improve fisheries management through national and regional legislations, increase education and public awareness, improve research activities and mobilise information into action. Before year’s end, sawfish were listed in Appendix I of the Convention of Migratory Species (CMS) at the meeting of the Conference of Parties in Quito, Ecuador. Just over a year later, all five species were added to Annex 1 of the CMS Memorandum of Understanding on the Conservation of Migratory Sharks. Footage from a 2016 sawfish expedition to Andros, Bahamas with Dr. Dean Grubbs, researchers from FSU Coastal and Marine Lab and NOAA. This footage is remarkable not only because it is the first live footage of a sawfish giving birth in the wild, but also because this incredible female Smalltooth sawfish was first tagged by the Bimini Biological Field Station in 2002! Back then she measured 260cm and she now measures 429cm. She also confirmed hopes that Andros is a Smalltooth sawfish pupping ground and will help researchers and conservationist push for better sawfish protections in this region. This beautiful lady could potentially be one of the most important individuals in the world for the scientists who study Smalltooth Sawfish. Although an immense amount of work still needs to be done to stabilise sawfish populations around the world, success is possible through the implementation of educational programs and strategic conservation initiatives. For more information on SOSF’s 11 sawfish research and conservation projects, click here.